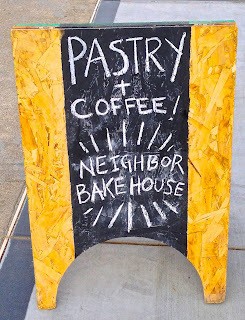 I've done bits and pieces of Neighbor Bakehouse in the past, but since I've hit them up on a regular basis, I've had the opportunity to try a variety of goods, both sweet and savory and thought I'd wrap them all up in one tidy review. Refreshing your memory on some old faves and showcasing a couple of newbies I've noshed on lately. 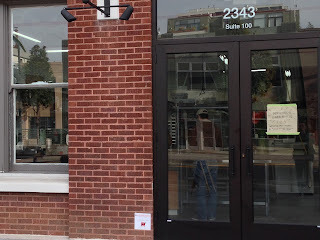 As a reminder, they've were doing wholesale baked goods for a couple years before finally opening up the space to those of us who live/work in the hood. Their hours are roughly Wednesday-Saturday 6:30am till they sell out, which, depending on the popularity of an item, can happen pretty quickly. It amazes me that in this town of gluten free, organic, healthy eating, etc., whenever a new bakery opens their goods seem to just fly out the door. 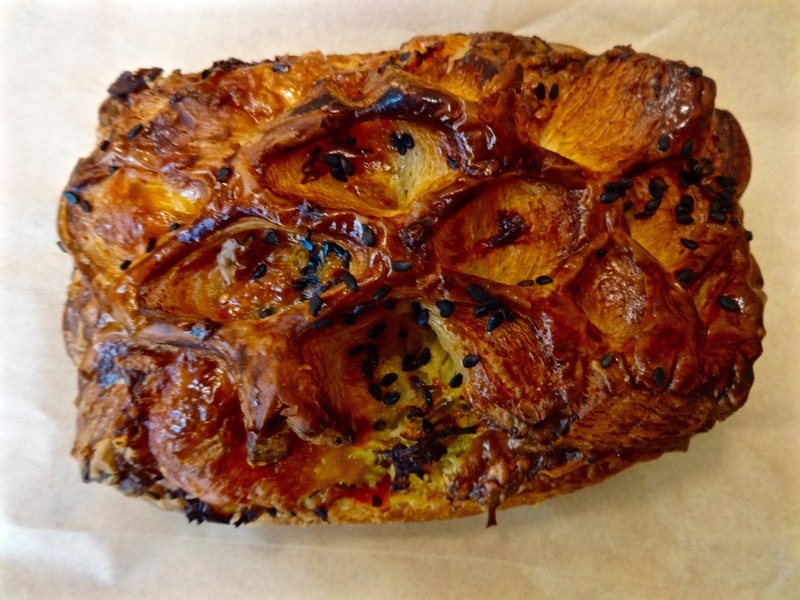 Anybody who's been to B. Patisserie, Mr. Holmes Bakehouse, Two Fish Baking Co. and more can tell you if you want to popular things, you need to go early or frequently. Ugh, the things you gotta do to eat in this city. But you know, I eat for you. 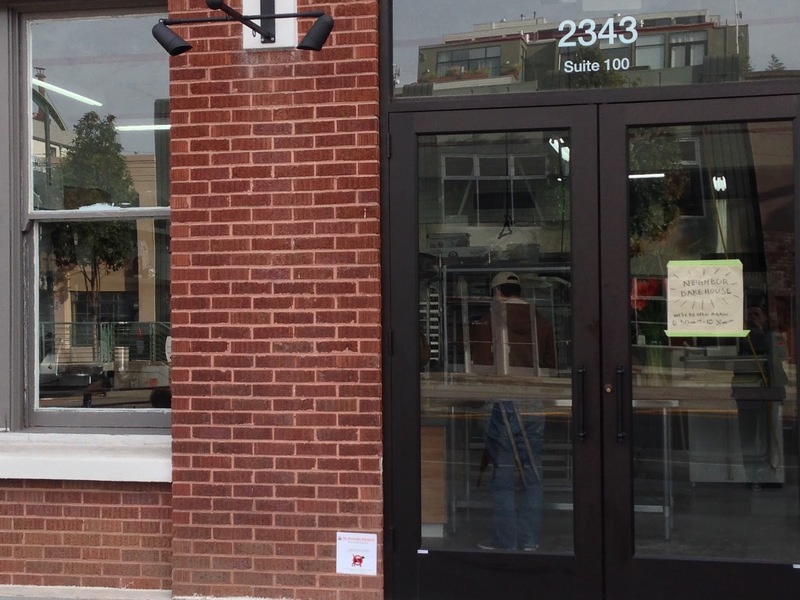 Yeah, the signage and exterior are a tad unassuming, it's what's inside that counts. 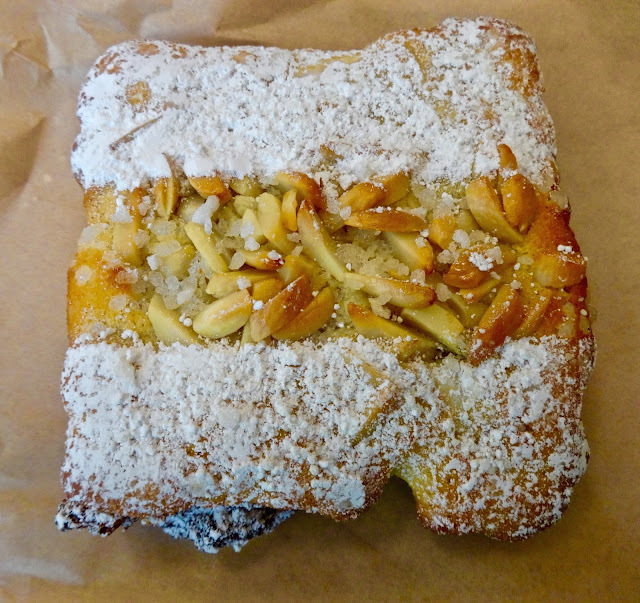 This is a bostock--a simple French delicacy where frangipane tops day old brioche. At least that is the standard definition of it. For me it tasted more like bread pudding meets french toast, covered in nuts. At first I was dubious, but after one bite, my sweet tooth was hooked. It's soft, cinnamon-ny, moist, nutty and delicious. It was also very sweet. Believe it or not, I only got through half before the rush kicked in. Not a knock, just a notation depending on your level of sugar absorption. Normally, I can plow through things like this, I think I was just having an off day. Needless to say, even as a next day treat it was still tasty. At $3.50 it's a great sweet treat to share. 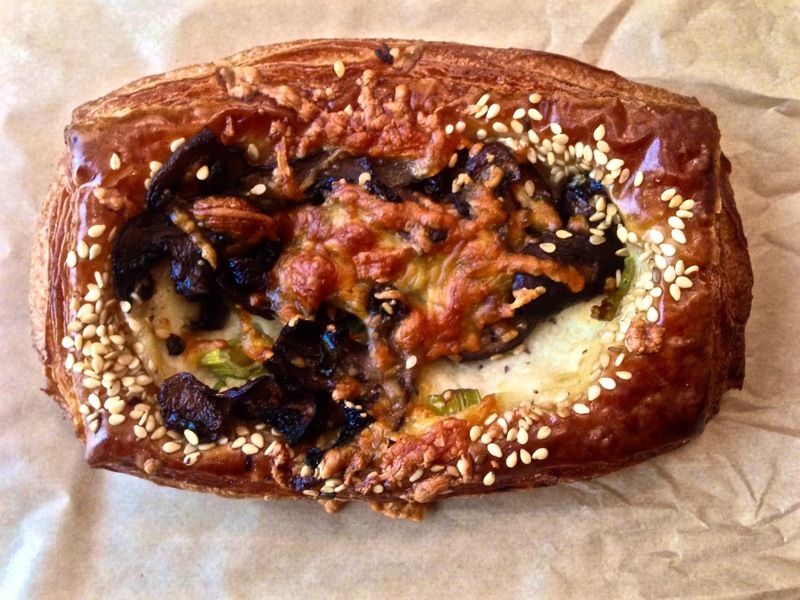 The mushroom and manchego cheese croissant tart thing. Buttery flakey crust, earthy mushrooms, cheese--what could be better. If you need a quick savory bite but don't want a whole sandwich or something this works perfectly. I couldn't help thinking it would have been really great warmed up or maybe even go all the way and put an egg on it--voila--it's breakfast. Still, as is, pretty good and just $3.50. A croissant tart thingy with sauerkraut and smoked cheddar. More of that buttery flakey crust with a nice savory addition of sauerkraut, which I liked as it wasn't too sour, but just tangy enough to know it's there. I do think the cheese element could be upped a notch to give it a little more oomph. Again, I couldn't help thinking how this would taste warmed up too. I think that's the thing with savory items, at room temp they are good. When heated up, they could be really good. At $4, it's decent size, tasty and filling. 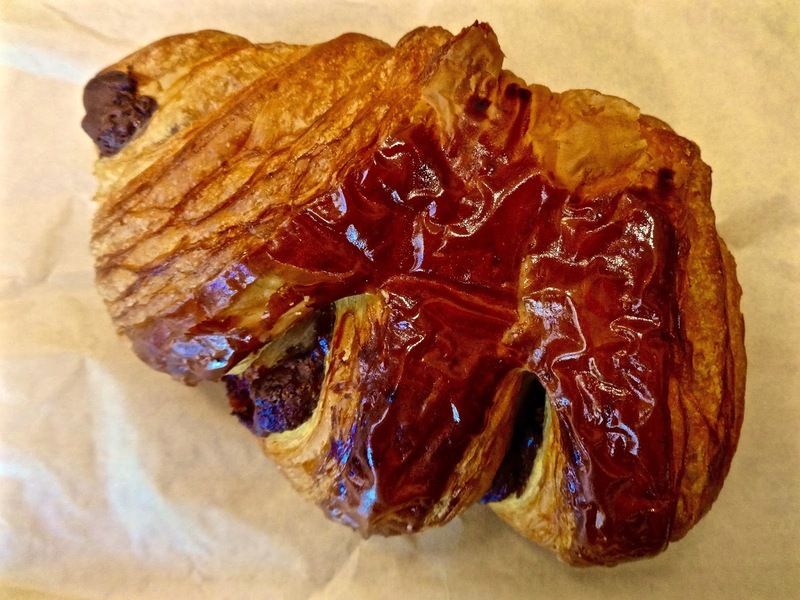 Chocolate bear claw croissant $3. In the realm of chocolate croissants this is a large and pretty good one. It has all the earmarks of flakey buttery crust and semi-sweet dark chocolate that you'd want. For me, I can appreciate it, but again, I fall into that category of wanting a tad more thickness in my sweets. Though, looking at this as a light morning bite with coffee, I think it is the perfect compliment. For all you croissant connoisseurs out there, you'll really like it. 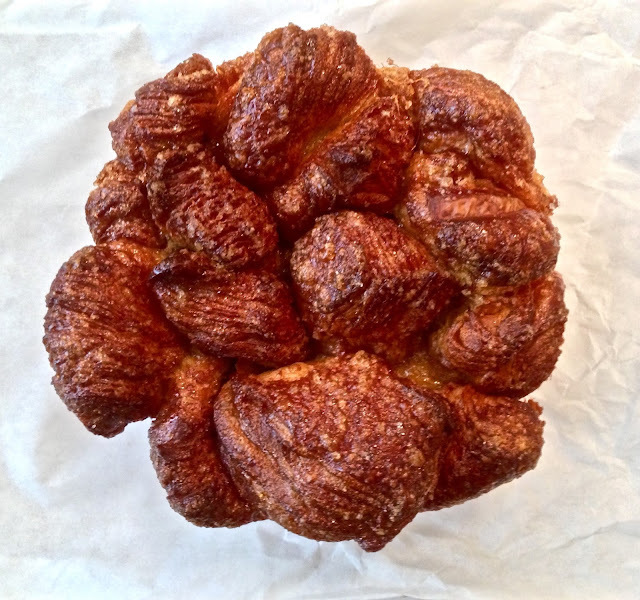 The ginger sugar pull apart. This is by far my favorite thing they make. 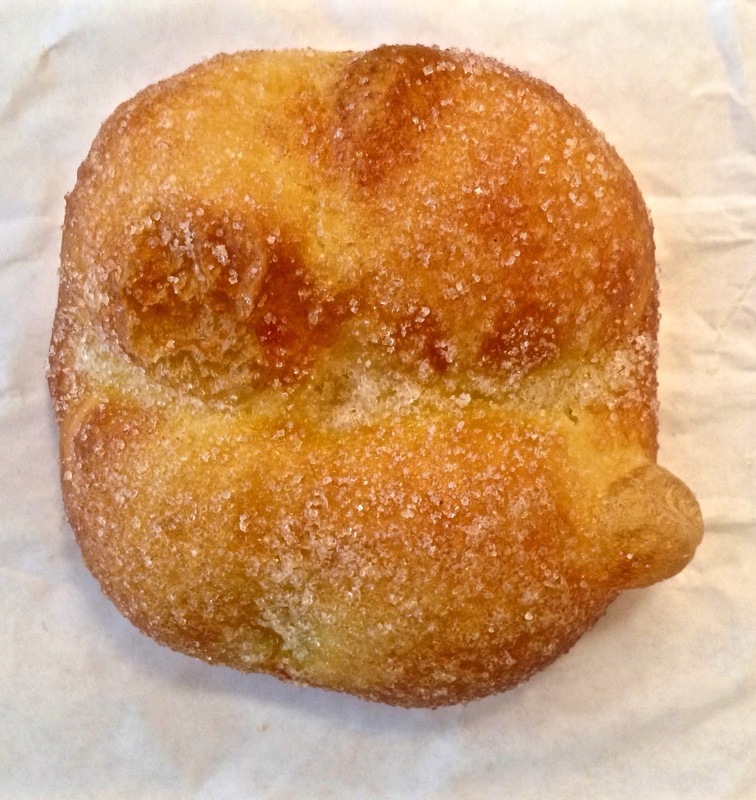 Yummy, buttery dough deep fried and coated in sugar with notes of gingers throughout. It's crunchy, doughy, hefty, sweet and all the things I look for in a dessert treat. It's like a fancy apple fritter without the apples and treacly sugar glaze. At $3.50 it is a mouthful of tasty that I have powered through on the multiple occasions I've had it. Sad? No, delicious. It also is one of their most popular and sells out regularly. But if you are going to try one thing here, this is it. 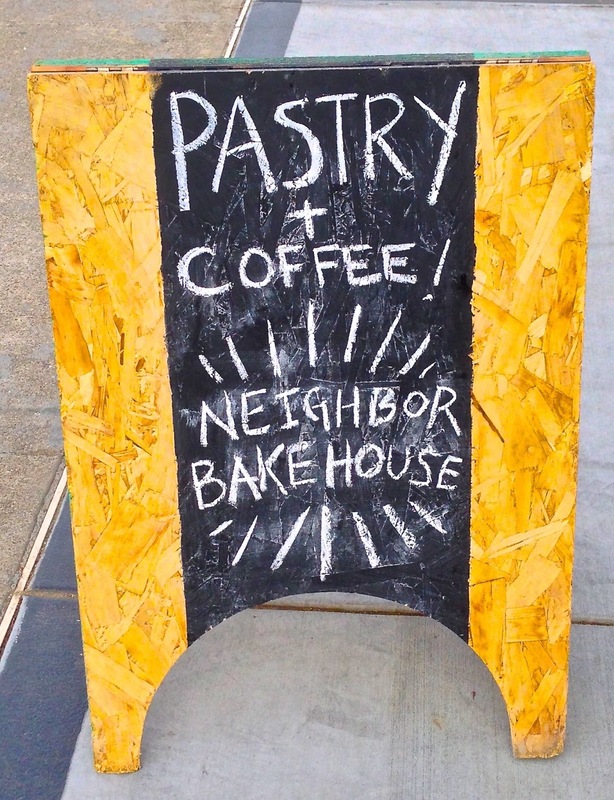 What can I say, I really like Neighbor Bakehouse and it's great to have it as a new bakery option in Dogpatch and San Francisco. I know it's not a neighborhood folks get to that often but if you work or live in the area, you probably already know about it, and if you don't, you should stop by and try it. Otherwise, if you are out and about on a Saturday morning, you should make an early day run to pick up some of their fresh made treats, both sweet and savory. Now if I could just get them to serve up some of the items warm, I'd find a reason to go every day.